By Dr. Luis Torres (Aug 9, 2018) The Real Estate Center at Texas A&M University. 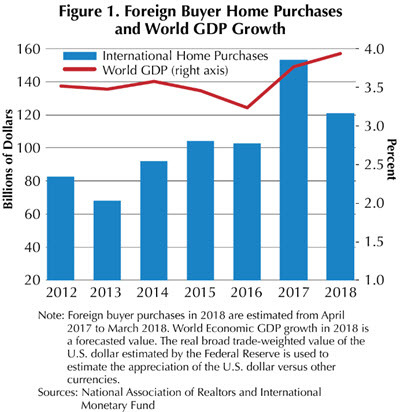 The National Association of REALTORS® recently reported that the sales of U.S. residential real estate to foreigners fell from $153 billion in 2017 to $121 billion in 2018, registering a 21 percent decline (Figure 1). Media outlets nationwide reported that the decline was due to Chinese buyers purchasing fewer U.S. homes. This is a small part of the story since Chinese purchases fell 4 percent by dollar volume and 0.4 percent by number of homes. The main reason foreign pu​rchases fell considerably was the decline in purchases by Canada, Mexico, and the United Kingdom (Figure 2). 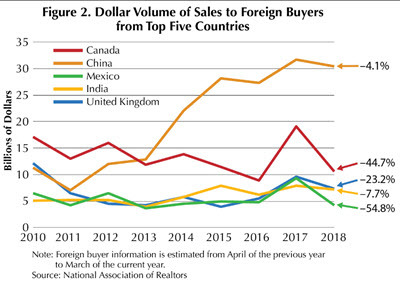 Purchases by Mexican buyers registered the biggest decline (55 percent by dollar volume and 29 percent by number of homes), followed by Canadian buyers (45 percent, 19 percent), and United Kingdom buyers (23 percent, 30 percent). Even India registered a decline of 8 percent by dollar volume and 12 percent by number of home purchases. These five countries represent the majority of foreign purchases. In 2018, their market share dropped below 50 percent by dollar volume of sales. So what happened? Why such a big decline? 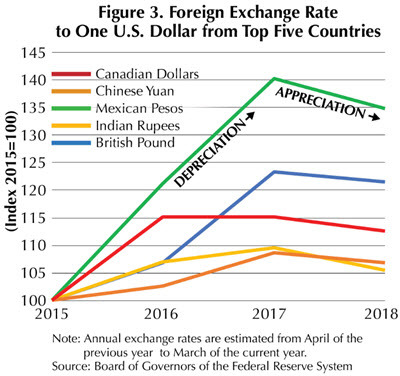 The exchange rate played a role as an accumulated effect of depreciation of each country’s currency starting in 2016, but overall the exchange rates of these five countries appreciated with respect to the U.S. dollar from April 2017 to March 2018 when the survey was estimated (Figure 3). The shortage of homes priced below $300,000 affected Canadian and Mexican buyers. The median price of homes purchased by Canadian and Mexican buyers during that period was $292,000 and $189,100, respectively. The uncertainty and headwinds surrounding international trade and immigration policy created a disincentive for people to purchase a home in the U.S. The other thing to consider is that April 2016 to March 2017 (the previous year) was a peak year in dollar volume sales to buyers from those countries, especially Canada and Mexico, and sales have reverted back to historical trends. Country-specific factors are regulations on capital outflows implemented by the Chinese government, United Kingdom’s BREXIT uncertainty, Canada’s and Mexico’s economic uncertainty about the outcome of NAFTA negotiations, and the slowing down of India’s economy in 2017. Texas is the third major destination of international homebuyers, even with the decline of Mexican foreign buyers. International buyers purchased 24,012 homes in Texas from April 2017 to May 2018, representing 7 percent of the total sales in the state, a drop from 10 percent the previous year, with a market value around $15 billion.